Posted by Ann in Fiction. 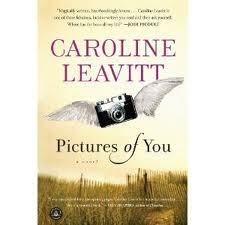 I’ve recently read two books by an author I hadn’t read before, Caroline Leavitt. Pictures of You captures your attention from the very beginning. Two women driving on a lonely fog shrouded highway are running away from their lives. There is an accident on the highway, and one woman survives, the other dies. Isabelle survives and becomes drawn to the family of April, the woman who died. This is a melancholy and bittersweet tale with characters you can’t get out of your head. Is This Tomorrow begins in 1956. 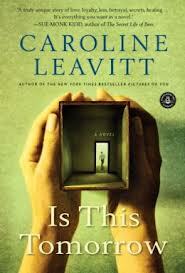 Ava Lark, a young divorced woman and her son Louis live in the Boston suburbs. Louis has made great friends with the neighbor children, Rose and Jimmy. One day Jimmy doesn’t come home. His disappearance colors both Ava’s, Louis’s, and Rose’s lives. The story jumps ahead to 1963. Jimmy’s disappearance still haunts his friends. When unexpected news comes of a resolution of Jimmy’s disappearance, everyone’s lives are shaken. A novel of loss and love set amidst the Cold War era.